I've got a new supplier that can print large sheet sizes at reasonable prices. I'm going to start with a couple of short-run test prints to try them out, which I will run as pre-orders rather than Kickstarters. One of them will be an A2 mapping sheet. 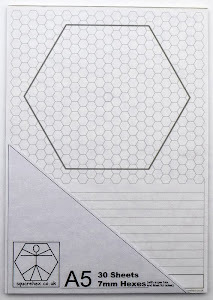 My plan is to have it printed with 14mm numbered hexes (I already have A4 sheets with these). The print run would be limited to 100 sheets which I'd sell at £1 each, 5 sheets for £4, or 10 sheets for £7. Those prices would include a card mailing tube, but postage would be extra. Just wanted to check potential demand for such a sheet. I'm also very happy to listen to other suggestions for large A1 and A2 mapping sheets. If the pre-order works well then my next Kickstarter could involve printing several different sheets.